Beautiful Flora is the Goddess of Springtime and flowering plants, especially those that bear fruit. 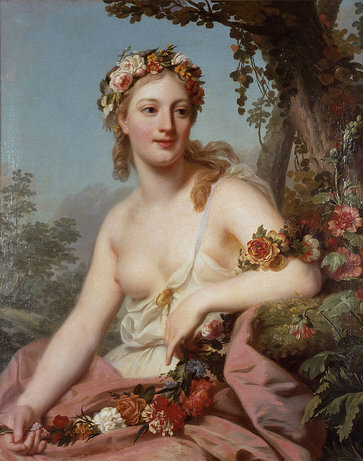 She has been depicted as a lovely young woman wearing light spring clothing, holding flowers and crowned with blossoms. She embodies the flowering of all nature, and teaches us to enjoy the pleasures of the moment and the promise of the future. Honey, made from flowers is one of Flora’s gifts to us. Appropriate gifts for us to give to Her as offerings are spring flowers, floral waters, floral perfumes and spring water. Her festival Floralia coincided with the spring blossoming of plants and was held from April 28 and May 3. The festival began with the dedication of Her temple and included sporting games and bawdy theatrical performances. During the festival the fertility symbols of goats and hares blossoms of lupines, bean flowers and vetch, were prominent. Festival goers would wear brightly colored clothing and floral wreaths made of roses. Flora was a handmaiden of the Goddess Ceres and was responsible for the virgin birth of Mars by the Goddess Juno. Flora gave Juno a magick flower that when touched, caused pregnancy without the help of a man. Call on the Goddess Flora to help you tend your flowers, orchard and garden. She will teach you to awaken parts of you that have been dormant. She will lead you appreciate the beauty and wonder of the Earth. Flora will help you to conceive new ideas and plans, and She will help them to blossom for you. To connect with Flora spend time outside in the early spring sunshine appreciating the warmth of the sun, the scent of the breezes and the beauty and diversity of the spring garden. Place fresh flowers in your home or sacred space, create a pretty floral crown, open your windows , and re-kindle the joy that has been dormant within.